Let me be the first to shout out a huge congratulations to Nathan Shepherdson for taking out the 2013 Griffith University Josephine Ulrick Award with his poem, Selling Meaning in Negative Space. 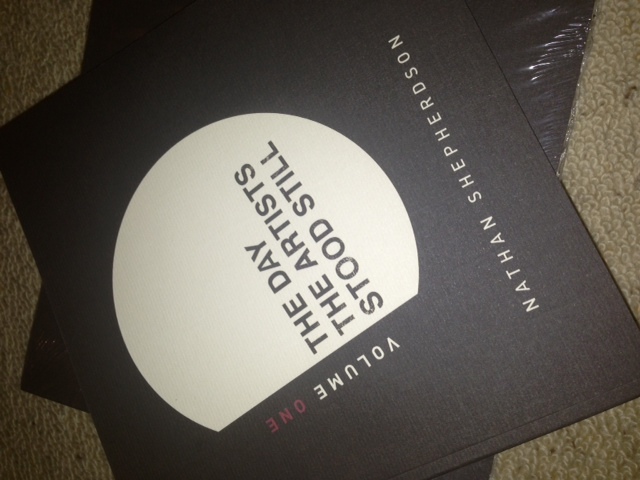 I received this exciting news at the same time I peeled open the first box of books containing Nathan’s latest collection, The Day The Artists Stood Still [Volume One]. The book looks and feels like an object of beauty… truly fitting for the astounding work that lies within the pages. Here’s a pic to show you what I mean. And don’t forget, you can pick up a copy of Nathan’s new book at the launch this Saturday, August 24 as part of the QLD Poetry Festival session, Dancing in Abstract. The session will be held in the Shopfront Space of the Judith Wright Centre of Contemporary Arts from 4:00pm – 5:00pm. Hope to see many of you there!